Rexton was shaped through the hard work of its citizens and that hard working spirit continues today. Here are the stories of some of the former citizens of Rexton whose names went down in history. William John was the son of William Bowser, a storekeeper, and Margaret Gordon Bowser. 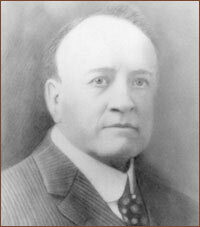 He was educated in local schools before attending Mount Allison University and subsequently Dalhousie University, from which he received a law degree.William Bowser reached the acme of his political career when he became the seventeenth Premier of British Columbia. On the death of William Brait, Alexander Brait Carson (1862 – 1925) inherited the store and moved into the Brait home, where he lived until his death. Throughout these years he managed the store and adjoining farm.His first wife was a Miss Smith; they had one daughter, Helen who became Mrs. Herbert Irving (Herbert was a half brother to K.C. Irving). After the death of his wife, Alex married Jessie MacFarlane of Saint John and they had two sons, Kenneth and Stuart. Kenneth (1897 – 1971) managed the store until its sale. He then became secretary to the Premier of New Brunswick, Hugh John Flemming. He was later appointed New Brunswick Citizenship Court Judge, a post he held until his death. Kenneth married Helen Henderson, R.N., of Moncton and they had one son, Alexander. Alexander was educated as a geologist and now holds an executive position with Imperial Oil, Calgary. He married a Calgary woman and they have two children. Kenneth’s brother, Stuart (1906 – 1959) married a Nova Scotia woman and they lived in Truro, Nova Scotia where he was auditor for the Public Works Department until his death. Very little information pertinent to the Brait Family is now available, though they did much in the development of Rexton. They date back to the early days when settlers were still coming from the British Isles in sailing vessels. A sister and two brothers in the family started a general store. Would you like a quart of molasses from the puncheon? A gallon of Kerosene for your lamps? A barrel of flour ground at a local mill? A buck saw? A cap, fur lined? We have it all! The store, situated across the street from the present day post office (what is now Kenney Park), was a place to meet friends and discuss the latest news. The Brait brothers were excellent merchants, honest and obliging so business prospered and they built the large beautifully situated home across from the store. This property is now owned by William and Vivian Kierstead who are currently working to restore it to its original grace. 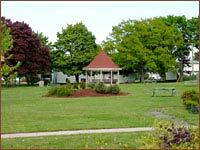 David Wark was not a native son of Rexton, but because he lived here for approximately 80 years and his interests lay in the good of the community and its people, he merits recognition.David was born in Londonderry, Ireland, but emigrated to Canada at the age of 21. “Distant fields look green” says the old proverb, and in the case of David Wark, the distant fields of New Brunswick were really green, much greener than the fabled green fields of his native Ireland could ever be to someone of his social status. During his first years at Rexton he kept the books for the local merchants and taught their children. He saved his money and in 1836 was able to purchase his own store, then went into milling and lumbering. Realizing his good sense and dependability, the people appointed him County Magistrate and then the Judge of the Court of Common Pleas. In 1842 he entered political life and was elected to the Provincial Legislature. He was later elected to the Legislative Council and then Receiver General. He was one of the original senators appointed to the Upper House in 1867 when the British North America Act set up the houses of Parliament for all Canada. David Wark did useful work in the development of trade, agriculture and education. He worked for reciprocal trade among the provinces and had influence in promoting the reciprocity treaty with the United States, a measure that gave New Brunswick ten years of prosperity. In the field of education his principal work was in forming a Provincial Board of Education and the reorganization of Kings College as the University of New Brunswick in 1859. After years of useful work in the Senate, he was able to enjoy the celebration of his one hundredth birthday in 1904, when citizens of Rexton and many prominent Canadian visitors observed it at Rexton in his honour. It was claimed that he was the world’s oldest legislator. A portrait of David Wark is in the Senate House in Ottawa. CLICK HERE for his biography on the Parliament of Canada Website.